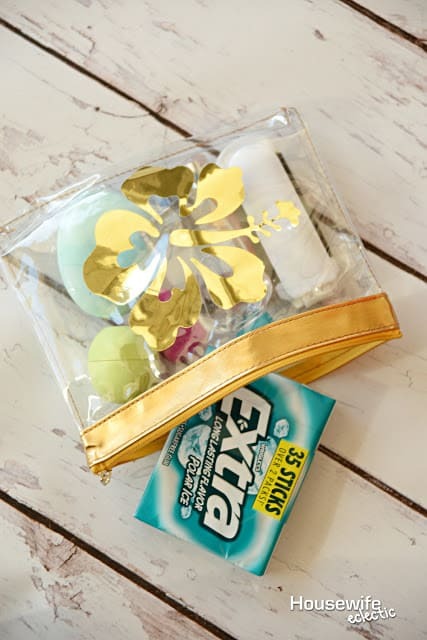 I keep several of these types of pouches in my purse to keep my organized, one holds my tech stuff like my battery pack, charge cord and head phones and another is what I call my refresh kit. It keeps all the little things that can help me ready to go again if I have been out and about. I have used it when I forgot it was picture day for my daughter, when I suddenly have a meeting come up or I am meeting someone for lunch after running errands. It is a small pouch that fits everything I need, I have included what is in my pouch below, add or take away to make it your own. These pouches are also so fun to make for friends, who doesn’t want a little pouch filled with purse goodies I love filling it with my favorite goodies including Extra Gum, Give Extra, Get Extra.
. To make these bags, head over to the Explore site and select the great big blue, Create a New Project button. 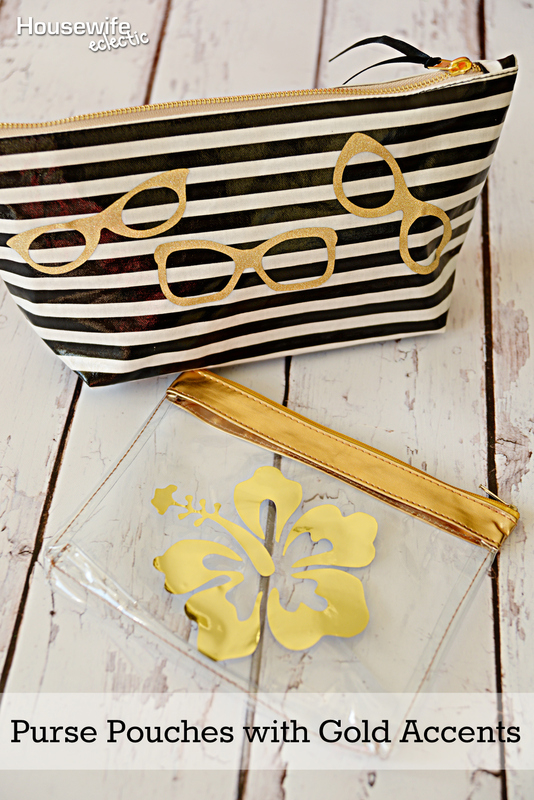 For the images on my bags, I did a image shirt for flower silhouettes and glasses silhouettes. I found ones that I thought would work well. Upload your designs to Cricut Design Space by selecting the upload image button. Your image should be pretty simple so select the simple image button. Make sure only the part of the image you want to use is selected, no white space. I found a Hibiscus for one bag and three different kinds of glasses for the other. 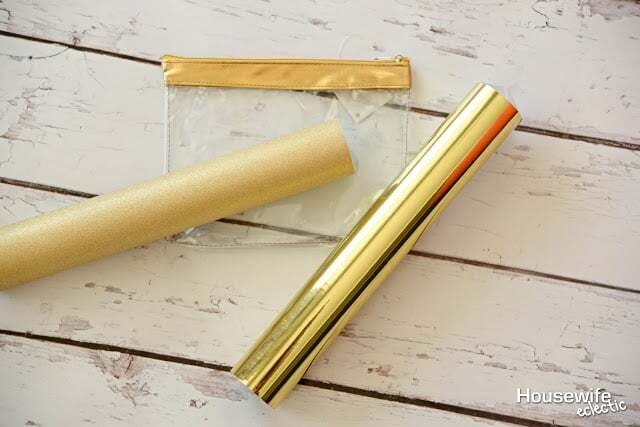 After you cut the foil or glitter vinyl, weed off the excess around the images. 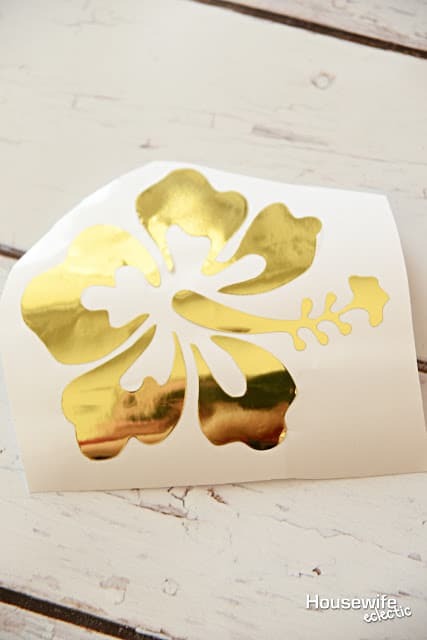 I cut the Hibiscus from the gold foil and it was harder to weed than a typical vinyl would be. I would recommend cutting on a heat transfer or other setting instead of vinyl to get cleaner cuts. The glitter vinyl weeded like a dream and I think it is going to become one of my new favorite things to cut! After you weed out your image, place a piece of transfer tape over the top of it. Using the edge of a scraper or credit card, smooth the transfer tape over the design until it pulls up from the backing. 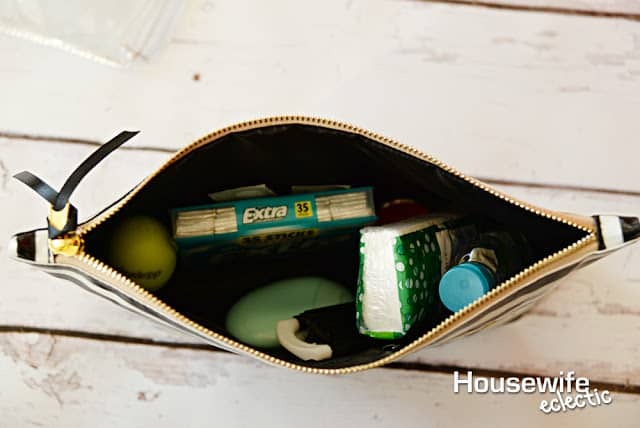 Lay the design down on your bag and then use the credit card to smooth it down again. 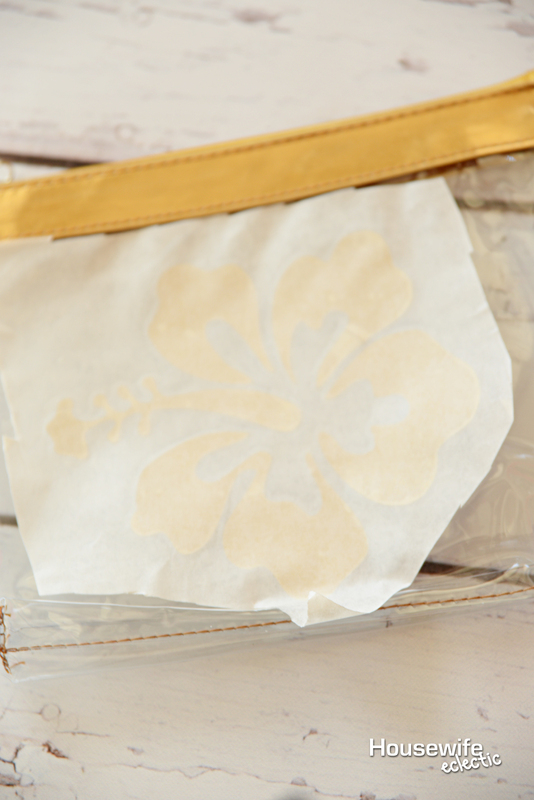 You don’t necessarily need transfer tape if you have a simple design, I used it for the hibiscus but for the glasses I just peeled them off the backing and stuck them on the bag. 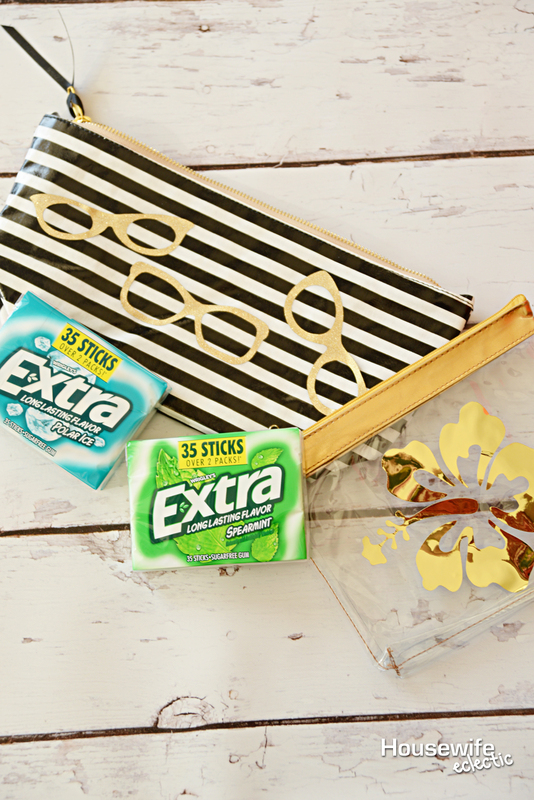 I use this cute one with the glasses on it for my refresh kit and it has been a total lifesaver. I can’t tell you how many times I have been grateful for a hair tie or a piece of gum when I need to freshen up in a flash. I have used this little trick for years and I LOVE it. Keep a magnet strip in your refresh kit and attached a needle, bobby pins and safety pins to it. It hold everything without them going everywhere and it lays pretty flat so it doesn’t take up space. You can make your refresh kit as big or as small as you need it to be for just about any size purse. I have two little ones and I am a working mom, so I have found most of these items to be essential. Hand sanitizer, tissues and adhesive bandages for the playground, a brush, Extra® Gum and lip gloss to make myself presentable in a flash if a business opportunity comes up. 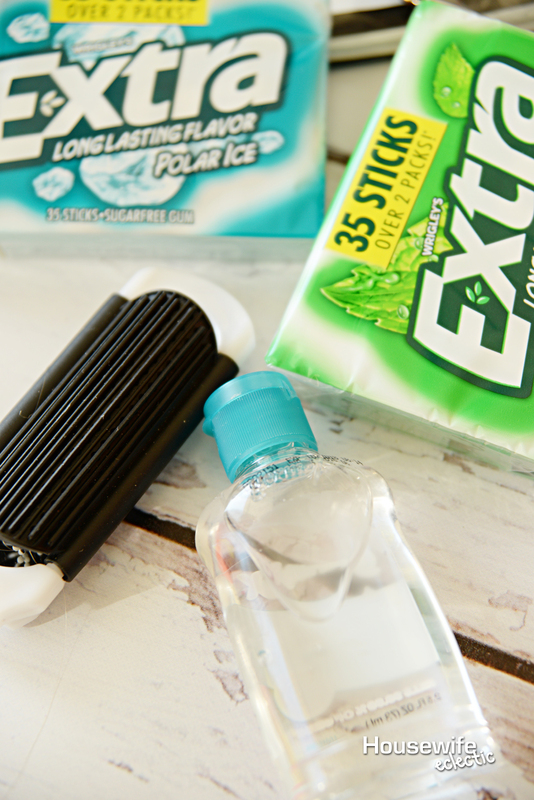 I love to carry the new Extra® 35-stick pack in my refresh kit, my kids are always raiding my purse for gum, so I love these packs because they have more gum I don’t have to worry about replacing them every week. They are easy to find in the Walmart checkout line and they feature durable but recyclable packaging. 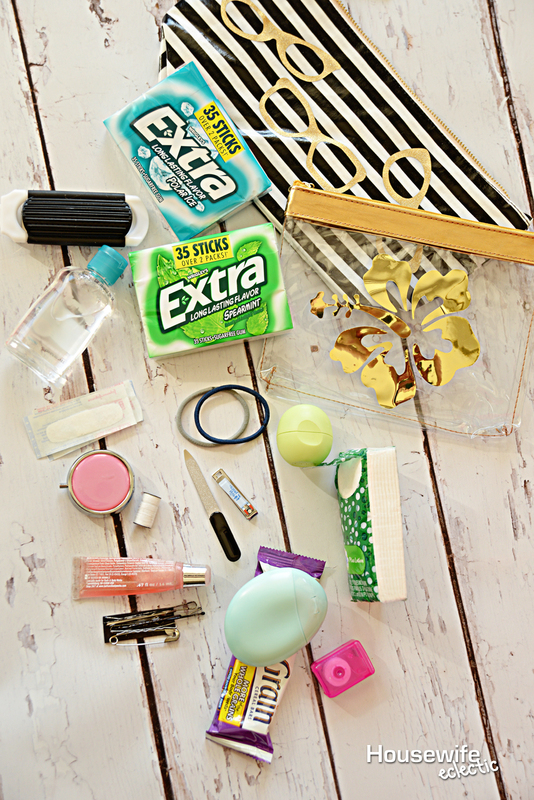 I personally like the Extra® Gum Spearmint. 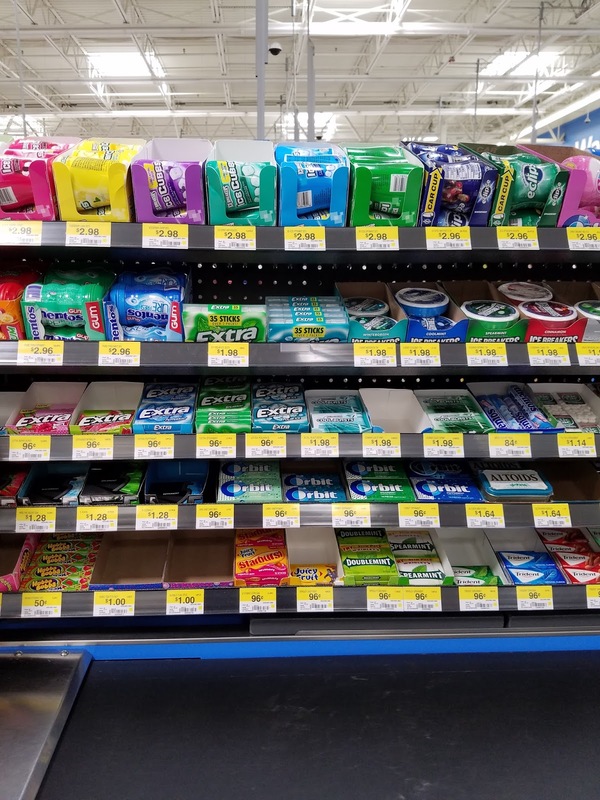 I found the new packs of Extra® Gum right by the checkout, where you find all the other gum, but bonus, this gum will last you a lot longer. These little gold pouches add just a little bit of bling, which makes fashion truly meet function. What would you include in your pouch besides Extra® Gum? I can't chew gum because of my TMJ, but I would definitely have some breath mints in there. Love your bag idea. Now isn't this a cleaver idea! I used to have something similar in my diaper bag but those days are long over now. I really need to throw something like this together for my purse. Okay, why haven't I thought of that?? I throw so much stuff into my work bag, pouches would solve the problem of having to dig through everything to find my keys or chapstick! So cute! I could definitely do this with my Silhouette, and I typically keep small pouches in my bigger purse. Adorable. I'd love to give these as little gifts. So cute. Got to love some chewing gum. 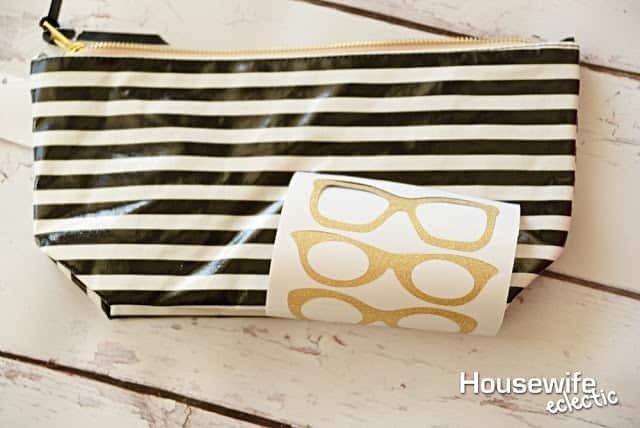 These gold and black pouches would be great for my makeup on the go. Love the gold accents. They really personalize the pouches. This is such a creative idea. You've got us thinking of all the other things we can do like this as well. These are gorgeous! 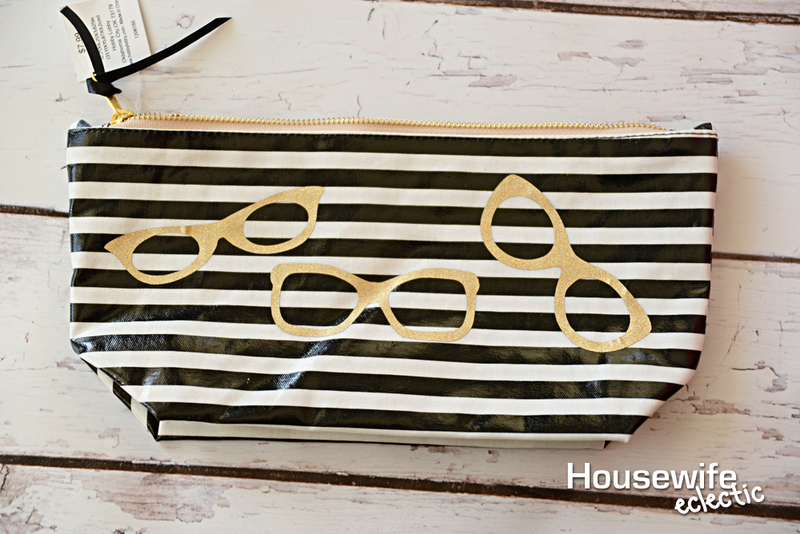 Purse pouches are the only way I can keep my giant mom bag organized! I like to divided my kits, so I don't have to mix every items together. The idea of using gold pouches give a glam to those kits. Love it! What a clever idea! So much easier to find things when they are organized. I have never heard of Cricut Design Space before, but it sounds intriguing. Purse pouches are always a must have for me. Without them, I am never able to find anything in my bag. I love the gold accent you added to each pouch! 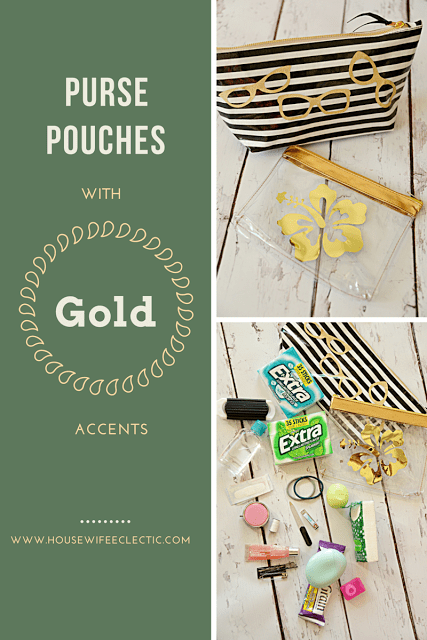 I need some pouches in my purse; and those gold foil ones are so cute! I need to try them on my cricut. Thank you for the inspiration! What a fun project! I love vinyl. I have a Silhouette but I never get it out. This is such a great way to jazz up and personalize stuff. Love the gold, too! Oh wow…you made these???!!! When I looked at the first picture, I thought these were bought. I want to make one. Pinned this. These are super cute. What a clever idea. I don't chew gum but I always have livesaver mints in my purse. Hehe what a fun little diy!! These are so cute!ally into these because it can fit in a diaper bag with no problem. These are so pretty! I love the gold!! Thanks for sharing at Merry Monday this week! This idea is brilliant and you are very creative. 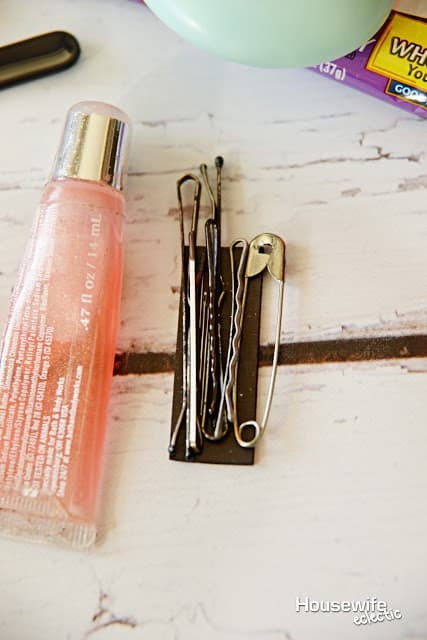 I really love how you decorated your accessories and I can't believe it is so easy to do!